doz ideas: Boko Haram and Their Kidnappings: Like Chibok Girls; Like Dapchi Girls: Another Deception? Boko Haram and Their Kidnappings: Like Chibok Girls; Like Dapchi Girls: Another Deception? In April 2014, Boko Haram terrorists kidnapped over 200 school girls from Chibok community in Bornu sate of Nigeria. Well, that was the story given to the world by the Nigerian government. That incident occurred few months to the Presidential election held in early 2015. From that day onward, the then incumbent president (Mr. Jonathan) was labelled as weak and ineffective. President Buhari who was in opposition then was hyped as a ‘strong man’ who would defeat Boko Haram and rescue the Chibok girls. Buhari won the presidential election. Few months later, he declared that Boko Haram has been defeated. Next was the gradual release of the supposedly kidnapped Chibok school girls. And surprisingly, the freed Chibok school girls looked healthier than other Nigerian school girls who were not in captivity. However, I have always believed that the Chibok kidnapping was a scam. The incident was designed to harm the reelection of Mr. Jonathan. Otherwise, how could anyone believe that Boko Haram kidnapped over 200 school girls, drove them about 100 km into Sambisa forest without encountering the Nigerian military; in a war torn area? If you believe that; you might as well believe that an elephant can be stolen from a zoo without traces. And here we go again. 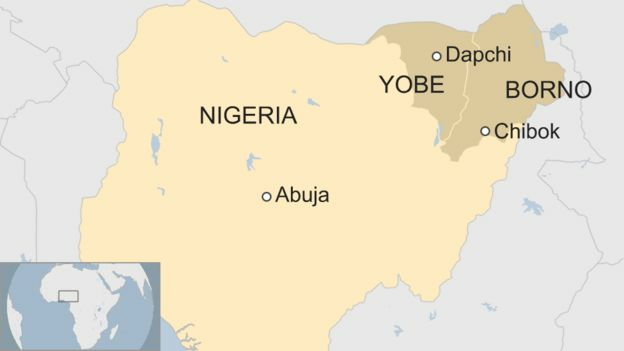 In February 2018, few months to the Presidential election in 2019, Boko Haram has once more, according to Nigerian government, kidnapped over 100 school girls from Dapchi in Yobe state. Now, this becomes very interesting. Chibok girls were allegedly taken to Sambisa forest. But Buhari's government claimed that Nigerian military forces have cleared Sambisa forest of Boko Haram. And so, where are the Dapchi school girls being kept? It must be in a safe place. But, where can you house 100 girls without drawing your neighbours' attention? Except that the girls were quartered in the government house of one of the conspirators. Once again, my opinion remains that this Dapchi kidnapping is equally a scam like Chibok girls’. It looks like a premeditated action by the Nigerian government to distract its citizens from the killings by Fulani terrorists masquerading as cattle herdsmen. Or it could be that the school girls were kidnapped to be ‘rescued’ soonest. Especially, as Mr. Lai Mohammed (information minister) said that the Buhari’s government has deployed 100 military aircraft for the search of the missing 100 school girls. That means one aircraft will be searching for a missing girl. Obviously, Mohammed being a renowned propagandist, his statement ought to be loaded with lies, and he didn’t disappoint. Has Nigeria got 100 military aircraft in its fleet? Could America, with its enormous military arsenal, deploy 100 aircraft in search of 100 missing girls? The answer to both questions is NO. I believe Lai Mohammed made-up that statement to deceived Nigerians into believing a false sense of urgency and seriousness in the search of the ‘missing’ school girls by Buhari’s government. And when the girls are eventually 'rescued' in a record time in contrast to that of Chibok girls, it will perhaps bolster the already battered security credentials of Pres Buhari as a Retired Army General. Remember, 2019 presidential election is due in a few months and President Buhari is yet to make up his mind whether to contest. However, can these two kidnappings (Chibok and Dapchi) be a coincidence? But “…some things are too strange and strong to be coincidences” according to Emery Allen. Clearly, Chibok and Dapchi kidnappings have strong similarities to consider them a coincidence. In 2014, the government of Pres. Jonathan requested the Bornu state government not to reopen the Chibok girls school due to strong threats from Boko harm. But the Bornu state Governor disregarded that request. The girls returned to school and a few days later, they were suspiciously kidnapped. In the case of Dapchi girls, the Nigerian Army in Yobe state was informed of an intelligence that Boko Haram would attempt to kidnap school girls in Dapchi town. Instead of fortifying the area against Boko Haram, soldiers were withdrawn from Dapchi. A few days later, Boko Haram kidnapped the girls. In both cases (Chibok and Dapchi), some girls who managed to escape from the ordeal narrated the same story. The girls were taken in a military truck. And the men who encouraged them to enter the truck were in military uniform. They told the girls that they have come to save them. All the same, I may be wrong in my assessment of the situation, but let’s see how long it will take to rescue the Dapchi girls. Whatever is the outcome, there’s a clear deception going on in Nigeria in relation to 2019 presidential election.